Nimbuzz - Free messages, Free Calls. Unlimited! 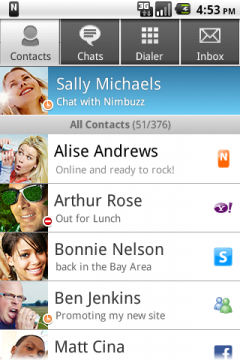 Nimbuzz Messenger lets you chat with your buddies on Facebook, Gtalk, Yahoo Messenger 24x7 for free. Connect your address book and share unlimited photos, files, music and videos with other friends of yours on Facebook, Yahoo Messenger and Gtalk . You can also connect with your friends on Twitter using our popular chat buddy. •	GROUP CHAT - Enjoy group conversations by sending text messages to your contacts in a single group. •	CHATROOMS - Make new friends in chat rooms and share your location for easy face-to-face meet up. •	FREE PUSH NOTIFICATIONS: Appear always online and be available to chat with Push Notifications for incoming messages. •	CHAT BUDDIES – Use our popular chat buddies for Twitter, Cricket, Astrology etc. •	AND MUCH MORE: Custom chat wallpaper, Landscape mode, Contact sorting, improved Presence Icons, file sharing, precise message time stamps, Chat history, N-world, free Avatars and much more. · Introducing Persistent Group Chat: Enjoy group conversations with contacts. Send unlimited text messages to your contacts in a single group. · Favorites Tab - for your favorite contacts. · Last Seen Online - shows you the last time your friend was on Nimbuzz. · Echo Test - for testing the audio quality of Nimbuzz calls. · Feedback & Support - Send messages regarding feedback and/or support directly to us. Get a free clairvoyant counselling chat with gifted online psychics via webcam!